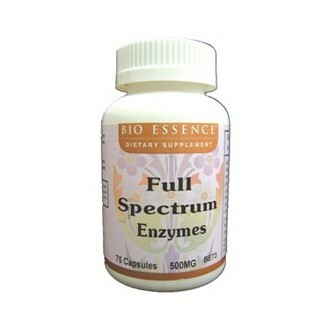 Full Spectrum Enzymesis a non-animal source multienzyme blend containing a combination of Protease I and II, Alpha and Beta Amylase, Cellulase, Lipase, Lactase, Maltose and Invertase. The product is a special patented formula that works with the body's digestive system. 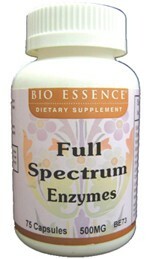 Full Spectrum Enzymes's is most effective in the pH range of 3 to 9 throughout the pH variations in the digestive tract. The combination is so well-designed that it has a very broad specificity on various proteins, very complex sugars and carbohydrates. Almost 10% of the general population is lactose intolerant. Lactose intolerance combined with non-digestible sugars creates gas and bloating problems for many people. Lactase helps to ease these problems. It has been shown that acid-stable lipase from plant source is many times more effective than larger doses of conventional pancreatin to help malabsorption, malnutrition and steatorrhea due to pancreatic exocrine insufficiency. Full Spectrum Enzymesprovides high activity of acid-stable lipase. Enzymes play an important role in our immune system as well. They help digest food when our body's own secreted enzymes are in shortage due to a weak digestive system, aging, improper diet or improper food combination. Damaged natural enzymes within food due to food processing or cooking are yet another cause of digestive problems. Extra unused enzymes from the supplement Full Spectrum Enzymes will be absorbed into the blood stream and will help to break up immune complexes, allergens, fat deposits inside the blood vessels; to expose tumor cells to the immune-cells?attack by digesting the camouflage surface structure of the tumor cells; and assist in cell differentiation. Enzymes can also alter by-products of tumor cells to reduce the side effects of cancer. Also used for Rheumatism pain to digest protein molecules that cause allergic or inflammation from the attack of body immune system. The enzymes are provided by one of the most prestigious companies in USA that specializes in making various kind of non-animal source enzymes.